My sister owns an organic farm (crops: spelt, soybeans, oats, corn,etc). and on her farm she serves hamburgers – the best hamburger recipe. It’s not unusual for her to have 10 for dinner, unexpectedly. Throw on some more baked potatoes (or potato fries, below) and just don’t call me late for dinner!, as they say around the farm. 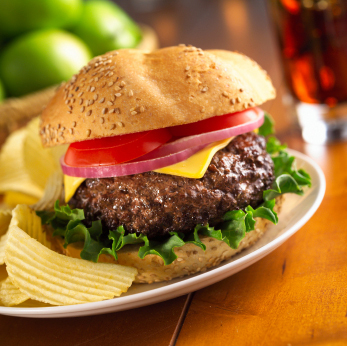 Really, always a crowd pleaser, you don’t want to miss this BBQ burger. Mix all together, than form into patties. Press with waxed paper to firm and hold shape. Cook on grill 5 minutes high to sear, than on low until ready. how do i keep hamburger patties from falling apart / how do you keep hamburger patties from crumbling? the egg makes it stick together on the grill – and squish them between two plates (prior to cooking) – works better than any hamburger press I’ve ever used. May want to put waxed paper under each pattie for easier removal from the plate and for stacking. We often make up a batch of burgers and freeze the extras. Pre-flatten and place between parchment paper, as wax paper will stick, but parchment will not. When you think the food is almost ready, remove it from the heat source and insert the thermometer in the thickest part of the food, away from bone, fat or gristle. Resume cooking if the proper temperature has not been reached. Be sure to wash the thermometer in between temperature checks. 4-6 large potatoes – cut into wedges Oil to coat! They raise their own beef for their family’s consumption, and if you’ve never had beef or chicken like theirs, honestly, there’s no going back. Anything in the store is like cardboard alley, and even the finest restaurants don’t get natural flavour like that.